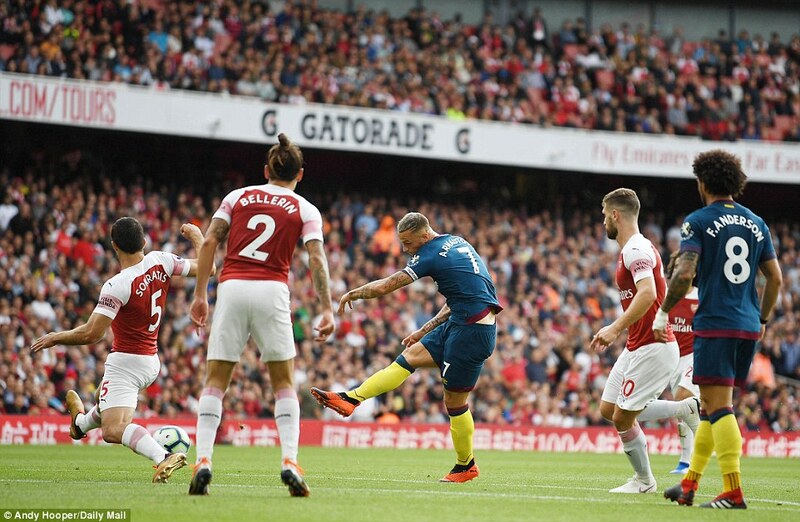 West Ham fell 3-1 in their third Premier League match of the season at the Emirates Stadium. This London Derby saw a back and forth match without much slowing down of play in the middle third of the pitch. For Unai Emery’s side, it was sorely need win for a new coach following his legendary predecessor. For West Ham, it was a talented team that still hasn’t sorted the problems with their defending. Just like last week’s match, the Hammers took the early lead with Fillipe Anderson taking it deep into Gunner’s territory and playing Arnautovic back and forth. Arnie took possession just outside the penalty area and his strike stayed low and beyond Cech’s reach. With the early lead in the 25th minute, the home side looked to pull even. Less than five minutes later, Arsenal did just that, as Nacho Monreal tapped in a long cross from Hector Bellerin. West Ham almost retook the lead as Arnautovic had a good shot into the net off of Snodgrass’s service, however the play was ruled offside. After a half of back and forth play, both teams retired during the break and Arsenal brought on Alexandre Lacazette to add pace to their attack. The other big change that hurt the Hammers was an injury to Arnautovic that caused him to return to the bench in favor of Javier Hernandez in the 58th minute of play. Once Arnie left the pitch, it seemed West Ham’s counterattacking threat left with him. After keeping the pressure up on West Ham for much of the half, Arsenal finally took the lead when Lacazette’s strike rebounded off of Issa Diop for an own goal. The visiting club’s chances to equalise were few and ineffective for the remainder of the match. Anderson did have a beautiful run in the closing minutes of the half, but after passing to Lucas Perez on the far left side, Perez’s cross to Andriy Yarmolenko was out of reach for the Ukrainian, and was West Ham’s last best chance of evening the score. Into the four minutes of added time, Arsenal padded their lead as Danny Welbeck fired the ball past Fabianski, and basically ended the match. Many times West Ham looked disorganized on their defense. With Ogbonna not even selected for the bench and Winston Reid still recovering from long-term injury, Pellegrini went with a roster of newcomers. While individually talented, it is obvious they haven’t found a way to mesh with one another. The £100 million summer does not seemed to have solved last year’s problem of surrendering too many goals. A Tuesday evening League Cup match against AFC Wimbledon might be a chance for Pellegrini to seek some answers. Next weekend West Ham hosts recently promoted Wolverhampton. Without finding some progress against Wolves, the schedule turns very challenging in the following weeks. After such a successful summer, the early weeks of this season have been beyond disappointing. If things do not turn this week, it will be another long September. The above article sums everything up for me. WE badly need to take something from the Wolves match. It will not be easy .